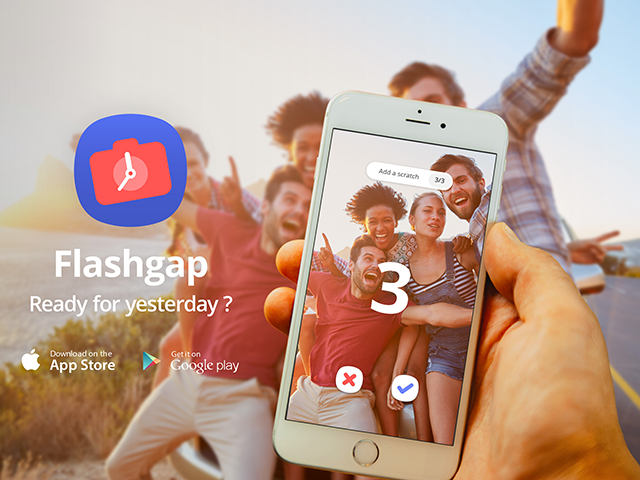 The Flashgap app allows users to create photo and video albums with their friends, with the contents hidden until the next day. Time-delayed photo-sharing app Flashgap has announced it has raised $1.5 million in a seed round of funding to launch its service in the U.S. The Flashgap app allows users to create time-delayed photo and video albums with their friends, with the contents remaining hidden until the day after they’re created. The Flashgap app was inspired by the end credits from the film The Hangover, during which photos from the group’s night are revealed. After downloading the app and creating an account, users can invite their friends to join Flashgaps, or timed groups. These can be private, so only the creator can add new users to the group, or open, so all users can add their own friends to the album. Once a group has been created, users can take one or more photos and videos within the app, which are previewed on screen for three seconds before disappearing into the album. At noon the following day, the full album is revealed for all participants to view. During a six month beta period in the U.K., over two million photos and videos were shared with the app. We’ve had great early success in Europe, and judging off the popularity of Flashgap for events, we believe that it could become of common use among people in their 20s for parties, weddings, concerts or any type of moments. The real objective of a startup is to stand out and swim the other way, change the user experience and establish a new product in everyone’s daily habits. Flashgap’s differentiation lies in the surprise generated by sharing the discovery of every picture the next day at the same time. The app is really about enabling you to relive the best moments from nights out with friends without needing to censor yourself on social networks because you might not look perfect or something embarrassing happened. It all just stays between you and your group of close friends. Flashgap is available to download for free on the iTunes App Store and Google Play.